Kungur . . . .
Kungur Ice Caves . . . .
Gulag Museum at Perm 36 Prison Camp . . . .
Kalinino . . . .
St. Nicholas' Men Monastery . . . . Weather: In the morning it is cloudless, clear, sunny and hot. In the afternoon it is partly cloudy, sunny and very hot. We have a very busy day ahead of us and we are up early. We have breakfast in the hotel at 7:30 AM and it is one of the better breakfasts that we have seen so far in a hotel on this trip. The buffet has a fair bit of variety and the food is pretty good. The attendants are very friendly and helpful by Russian standards. At around 8 AM we meet up with our guide and interpreter and we are soon on our way. We will be seeing and doing lots today, visiting the town of Kungur and it's ice caves, going to the Gulag Museum and then visiting a monastery that is trying to recover from Soviet destruction and neglect. But the main reason we have come to Perm is to visit the Gulag Museum at Perm 36. It is pretty much the only one of its kind in Russia. As we drive out of the city, our guide gives us a running commentary on what we are seeing as we soon pass out of the city center and into the industrial area. Until only recently under the Soviets this was closed city, with major military and space industries. Besides the bicycles and phones made here, Perm is known for being the builder of the first stage motors for the huge Proton Heavy Lift Rockets. Some new additions are the chocolate and beer factories. We are soon heading out of town and into the country. We are actually heading back the way we came, crossing through the forests and farm land to Kungur where our train stopped last night (if we had known, we could have gotten off there and met our guide there). After a bit over an hour of (high speed) driving we arrive in Kungur, an old town in the foothills of the Urals. The town gained great wealth when it's merchants established trade relations with Asia and became the largest tea dealers in the country. Now it is just a quiet backwater. Our main purpose in this town is to visit the ice caves, but we first stop off at the local prison to take a look at the nearby church. We can also see the steeples of the three other churches that were incorporated into the prison when built by the Soviets. They were used for various purposes, but they are now being restored and the prison service is trying to figure out how to return them to the community (maybe they will have to re-build the prison walls). 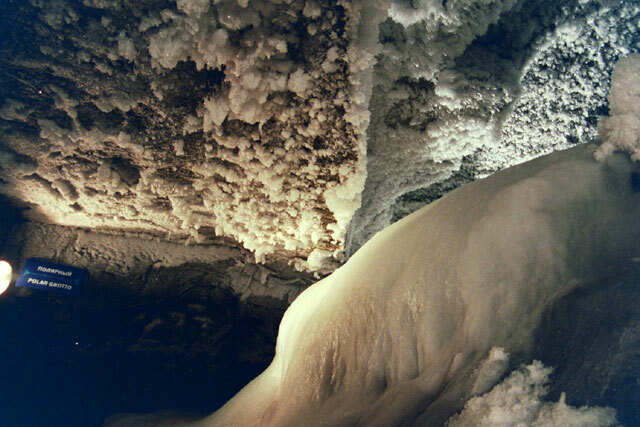 Then it is on to the Kungur ice caves. The ice caves are quite amazing. The cave system has over 5.6 kms of tunnels of which 1.3 km are open to the public. The most interesting part is that at the beginning and end of the tunnel open to the public there are permanent ice formations. This is actually very usual as caves are normally above zero degrees. We have come prepared with our cold weather gear and put it on as we enter the cave system. We have our own private guide who takes us down through the double doors and the long corridor to the first ice formations. It is amazing the way the ice forms various shapes on the floor, walls and ceilings. The whole place glitters like a chamber full of diamonds. It is an awesome place and we walk through a number of chambers with different formations. What is interesting is that we walk a short distance further into the caves and the temperature rises and there is no more ice. 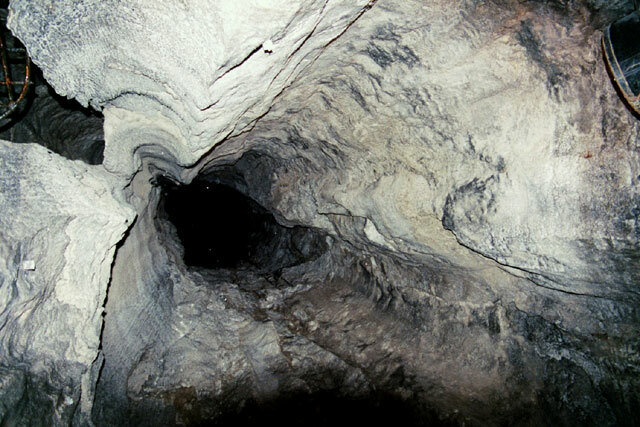 It is a long walk through the cave and we pass through a large number of chambers and grottos. The formations are quite varied and we see all sorts of stalactites and stalagmites. In addition, there have bee many rock falls that give the rooms strange characteristics. They have given each of the rooms a different name and the guide, with the interpreter translating, gives a detailed description about each room, including a number of legends and ghost stories. A couple of the rooms have large lakes that add a whole new dimension to the chamber. The lights have been placed well and give the rooms real character. A large Christmas tree has been placed in one of the rooms and, even several years later, it is still looking like new. Well preserved in the cool, dry air of the cave. There are also a number of chimneys that run high up into the ceiling above the caverns. We look up and all we can se is darkness. It is a great walk through and we are sad to leave at the end. As we open the double doors we are hit with what seem like a wall of hot air. The contrast with the out side is now huge and we have to quickly strip off our outer layers. We make our way back to the entrance and after a quick break, pile into the car and head on our way. We have a long drive to the Gulag museum. Along the way we pass through a horribly polluted town with a huge factory spewing all sorts of horrible things into the air. We pass through the town and at a safe distance pull over to the side of the road for a quick picnic lunch. If we look in one direction we see pristine forest at the foot of the Urals. The other direction is filled with smoke stacks belching smoke. After about a drive of two hours, including our short stop, we arrive at the Perm 36 Gulag Museum. This is an incredibly moving experience and our hats off to the few brave people to preserve and restore it and convert it into a museum. The Gulag was a huge system of prison camps that has it's origins in the prisons and detention camps set up by the Tsars. But the Soviets, in particular under Stalin, turned it into an institution of their regime. 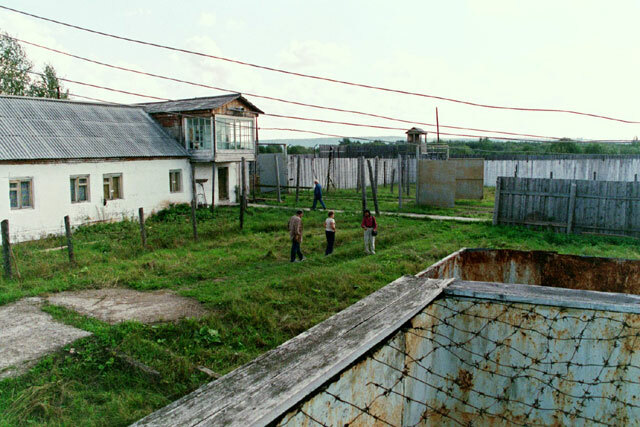 Siberia became synonymous with death under the huge network of resettlement programs, labor colonies, concentration camps and psychiatric hospitals set up and run by the Glavnoe Upravlenie Lagerey ("Gulag") or Main Administration for Camps. 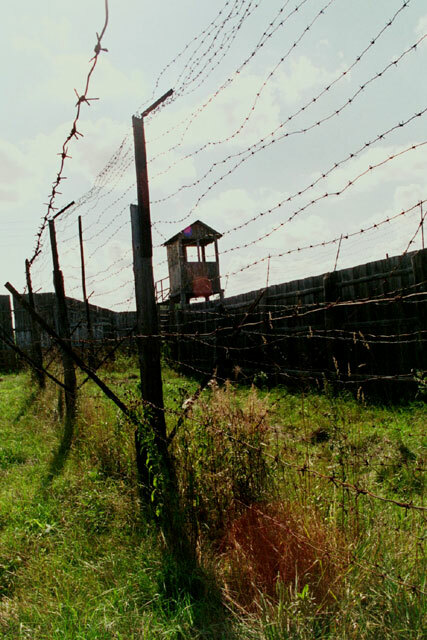 At one point in time, there were more prison camps in Siberia than towns. This camp started off as a labor camp where the prisoners were forced to log, chopping down the nearby forests. Under Stalin political prisoners began to arrive. The camp existed throughout the Soviet period, only being shut down in 1988. 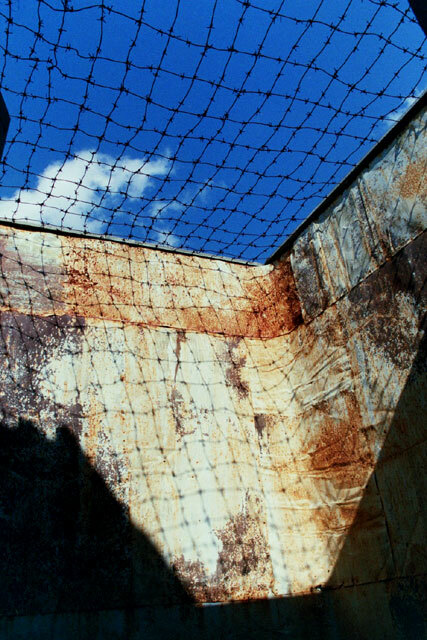 It is a shocking place which the Soviet regime tried to erase off the face of the earth after closing it. It was bulldozed after being closed, but a group of people were able to preserve what they could and they are in the process of reconstructing it to serve as a reminder to future generation of what happened and could happen again if we are not careful. They have done an excellent job with the museum, especially given their limited resources. 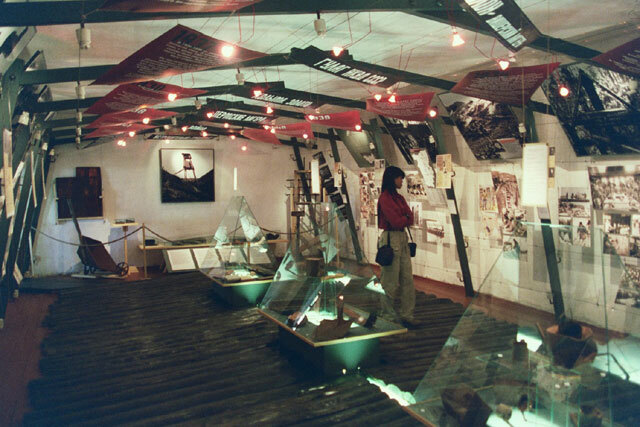 The exhibits, set up in several barracks, are simple but effective and hard hitting. Without emotion they set out what happened at this and other camps, what sort of prisoners were held and what they went through. It is horrible. Just as an example, we were shown the food allowance for each prisoner. If you did not work or were ill, you got about 1,000 calories a day. If you did 150% of your quota of hard labor (and these quotas were not easy), you got about 2,250 calories per day. The weather conditions are extreme. Hot in the summer and freezing cold in the winter. 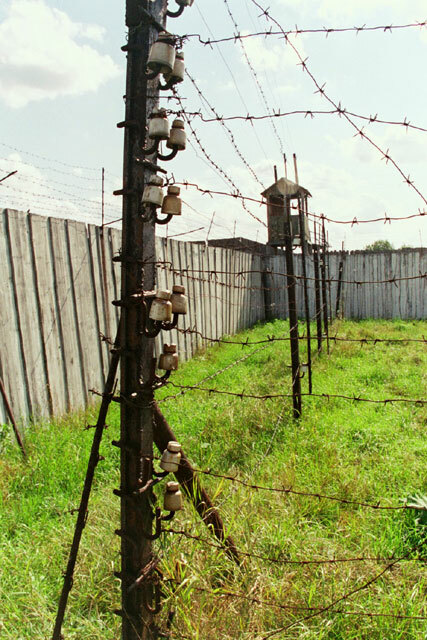 It is estimated that 20 million people died in the Gulag system. One exhibit is very disturbing. It is extracts from a prison log which sets out when prisoners arrived and then died. Many died the same or next day. The system was that brutal. This was a political camp, so those people who said and wrote the wrong things were sent here. The first camp we visited was the regular camp and it was hard enough as it was, with the small cells with concrete table, beds, seats and toilets. But then we went over to the special prison. The special prison was built for those prisoners who committed a second "crime" or who were not repentant or denounced their "crimes". This was an especially harsh place. The camp was surrounded by eight fences and had numerous guard towers. There were two paths between the fences where dogs would patrol. Guards were instructed to shoot any prisoner who approached the inner fence. The rooms were basic and there were punishment cells at the end of the block that were bare concrete with a slab for a bed. We then went out and saw the exercise cells. 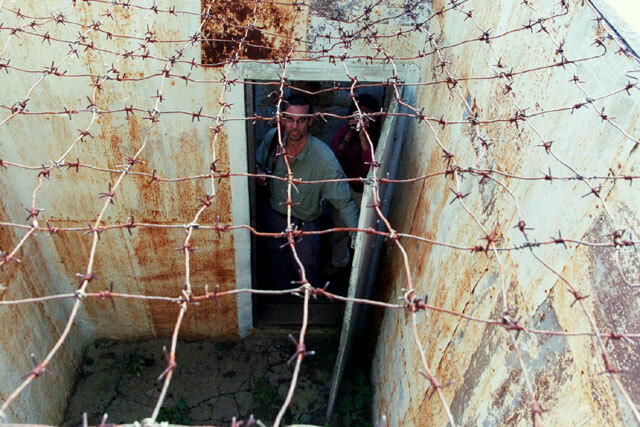 Each prisoner was given one hour to walk around this tiny cell with barb wire for a roof. 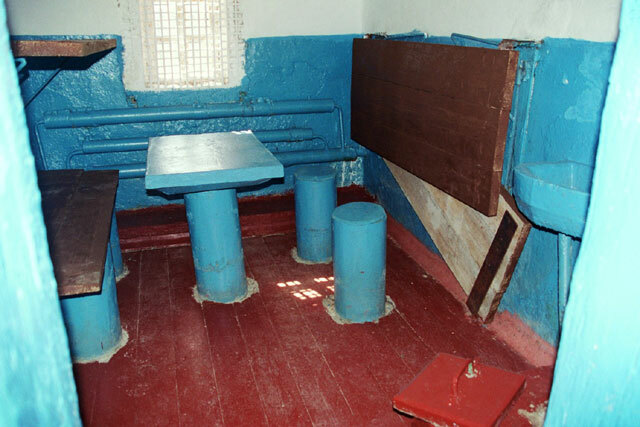 There was a platform built on the outside of the three cells, which would allow guards to observe the prisoners as they took their exercise. It was a brutal place. 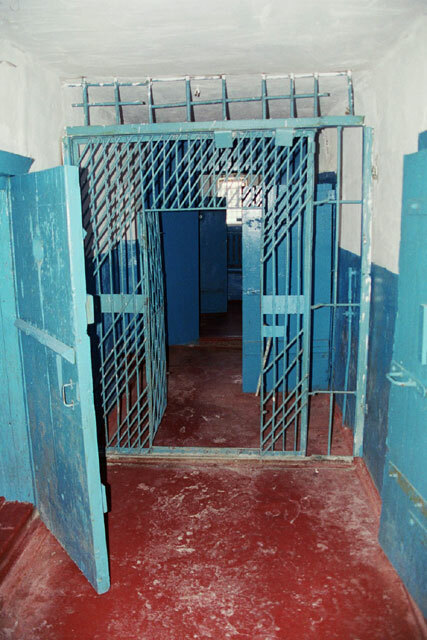 We exit the Special Prison by the double locking gates and make our way back to the main prison. We are shown into a room that has been turned into a presentation room to educate visitors, especially children, on the Gulag system. Soviet era paraphernalia and some prison uniforms and other mementos line the wall and fill cases. 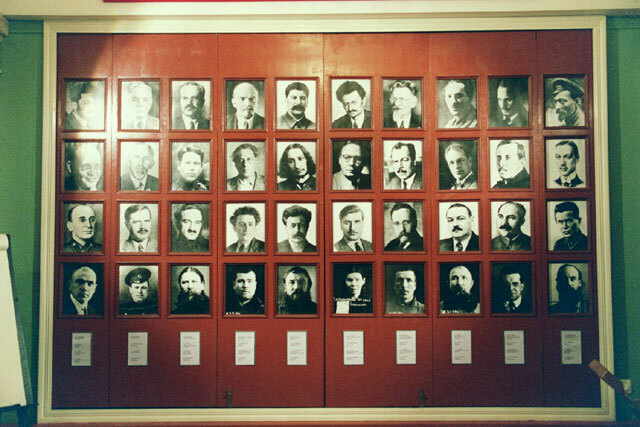 On the end wall is a collage of a series of pictures of people involved in the Gulag system from the rulers (such as Stalin and Beri) to the prisoners that passed through the system. We are shown a short video on the museum and the Gulag system and then we retire to the kitchen for some lunch. They serve us a nice meal and then it is time to go. We begin the long drive back. Due to the road system, we have to back track and follow the route we came in. 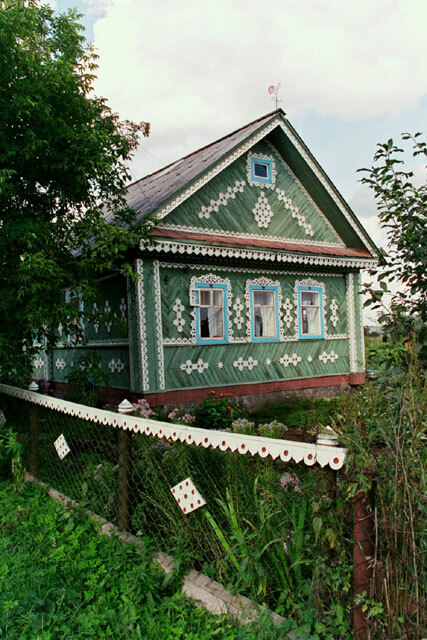 Along the way we pass through a number of small villages which contain the typical Russian wooden house. Some are very well done and maintained and we make several photo stops to check them out. We pass back through the polluted industrial town (glad to get through that place quickly) and make our way back to Kungur. 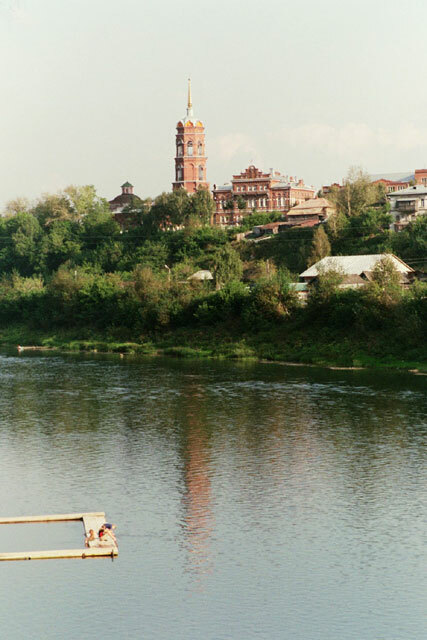 Once in Kungur we make a number of stops to check out some of the other sights, such as some of the merchants' original building, the bridge over the river and some of the other old buildings that gives the town some of it's charm. 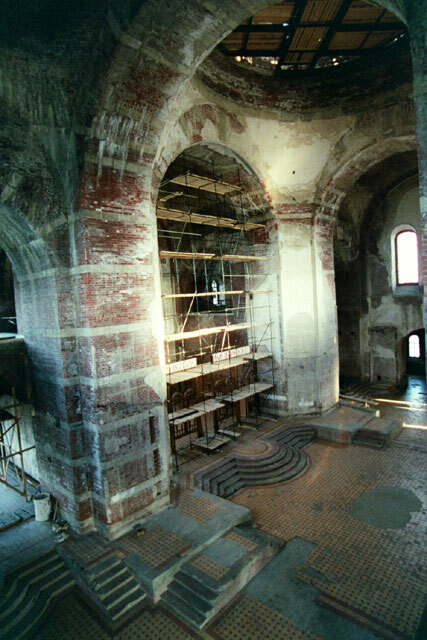 From here, we take a new route, deviating to go and visit a large monastery that is in the process of being restored. Along the way we pass through some beautiful countryside dotted with fields and forests. We then come upon the settlement of Kalinino, founded over 270 years ago. 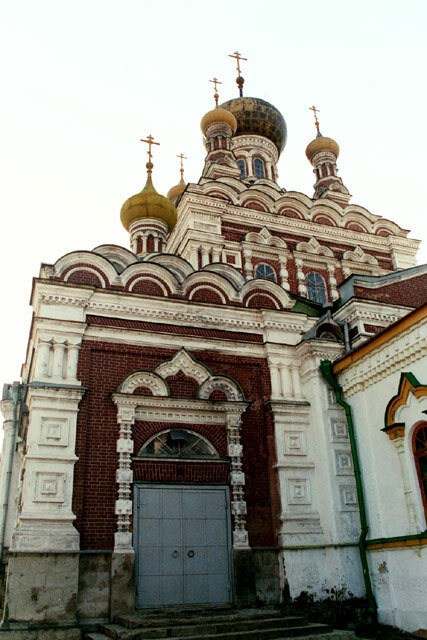 The remarkable thing about this place is that it largely populated with "Old Believers" that fled to this area with the reformation of the Russian Orthodox Church centuries ago. And these old believers that great pride in their homes. 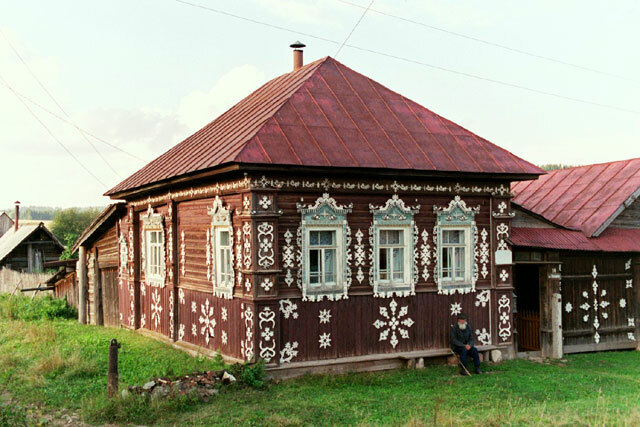 They spend a significant amount of energy decorating their homes with wonderful wooden carvings that represent snow flakes (symbol of purity). The best example was a home which is owned by a 90 year old man. His father built and decorated the house and it is fantastic. We stop and admire it, with the old man sitting out front. We wave, but he ignores us. Must see too many tourists. We carry on from here and within another 15 minutes we arrive at the monastery, called St. Nicholas' Men Monastery. 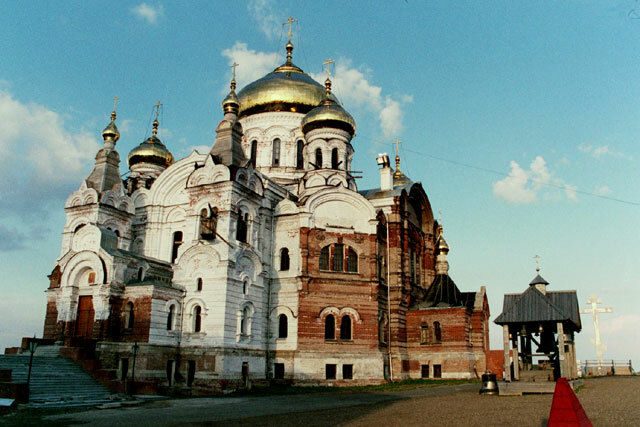 The monastery was built, at great expense and trouble, at the beginning of the 1900's on the top of the highest hill in the area in an attempt to convert the Old Believers. It was completed in 1914 and with its gold domes glittering in the sun light could be seen for miles around. But we do not think it worked in converting the Old Believers. In any case, it was very short lived. When the Bolsheviks came to power in 1917, they shut the place down. There were almost 500 monks in residence. 74 were taken and shot against the wall of the monastery (we could still see the bullet holes) and their bodies thrown over the edge of the hill. The other 400 or so were sent to camps in Siberia. They tried to tear down the monastery, but the walls were just too thick. So the domes were removed and it was set on fires. The roof was destroyed and over the many decades the weather took its toll. The rain and snow and frost did it's damage. The walls are still seeping water today even with a new rook keeping out any further water. It is just shocking to look around the place and see what damage could be done by a group of people who objected to or were afraid of a religion. We went up the stairs to the balcony above overlooking the main hall. Water was seeping from the walls. There were fire marks on the walls. A small section of the wall was dedicated to trying out techniques to restore the paintings on the walls. Then down we went to the main floor and then to the lower level. This has already been turned into a working chapel. But only men are allowed in, so Jacqui had to wait outside. It was dark and gloomy, with the main light coming from the many candles and the one lamp lighting up the book from which a priest was chanting. His melodious voice filled the chamber. We then head back outside to check out the exterior of the monastery. It still needs so much work. After being shown the wall with the bullet holes, we wander over to the nearby memorial built to the monks that were murdered or sent to the prison camps. 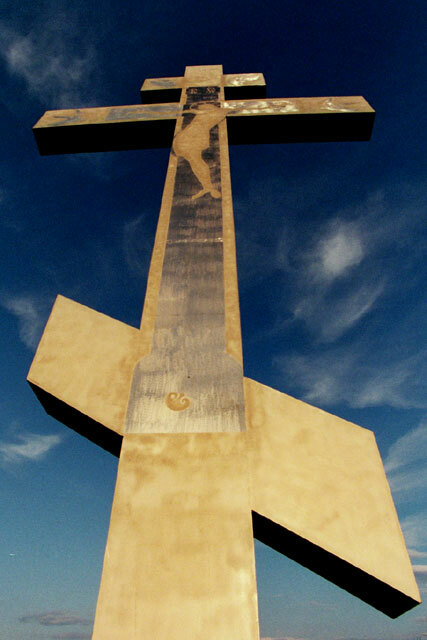 A huge cross juts up into the sky. From here we take a short stroll down to the holy waters that emerge from a well, but today it is dry. Then we make our way back through the grounds to the parking lot. Once back in the car, we begin our drive home. But we soon discover that something is wrong - we have a flat tire. We need to pull over and change it. We discover that it appears that someone had slashed the tire. Not sure why they would do that. It takes a bit over 30 minutes to change the tire and then we are on our way. From here it takes about two hours to drive back to Perm. The ride is a very pleasant one through farmland dotted with villages filled with wooden houses. The sun is setting and the sky is aglow with red and orange light. Soon, many of the lower laying parts of the farm land is filled with thick fog that shrouds the countryside in mystery. It is an amazing scene. We arrive back at the hotel just before 11 AM. We decide to skip dinner and just eat some of the snacks we have left in our room. It has been a great day, filled with a wide range of experiences and emotions, and we are ready for bed.